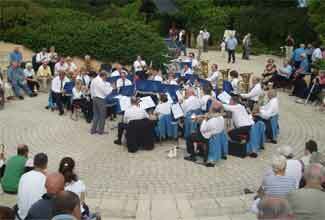 At the end of May the band started with the first of 21 concerts for the 2006 summer season. Now, as the season draws to a close the band can reflect on a job well done and are delighted at the turn out for the concerts and the response received. The highlights of the season so far were the usual Carnfunnock concerts and a wonderful day in Belfast city centre where the sun shone (despite the weather forecast) and where an unprecedented audience got into the spirit of things - even from the vantage point of the city's open-top tour buses. 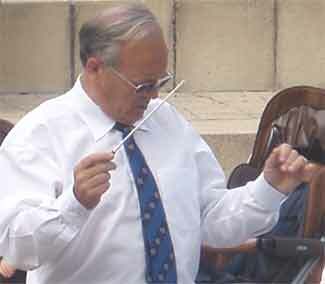 Yet to come, of course, is the annual joint concert at Jordanstown Loughshore on Sunday 27th August at 3.00 pm with our good friends The Ballyduff Band under the baton of their illustrious condustor Mr W Hill. The antics between the musical directors of the two bands has to be seen to be believed. It has been suggested that their medication should be increased before the show. Join us and judge for youself. After the summer season the band start on the busy task of rehearsals for the annual NIBA contest held in October in the Ulster Hall in Belfast. Many thanks to all who have supported us by attending our summer concerts and we look forward to entertaining you again soon.